The company was purchased in October 1954, by Art and Donna Alexander who wanted to realize their dream of owning their own business. 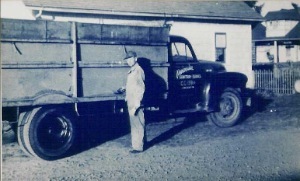 That business consisted of a house, a 1950 Chev open box truck, an old barn, and a few garbage accounts. Their office was a card table in the kitchen and an adding machine borrowed from former State Senator Sid Snyder. Art was his own boss and the only employee. At that time, he was only working 4 days a week. In those days, he walked into the customers yard for every can as there was no such thing as a curb rate. The can size could range from 30 gallons to a 50 gallon drum. Some customers were used to paying their bills by the barter system, which might be fresh fish or eggs. Many people would only pay their bill if Art would personally collect and then stay to socialize. 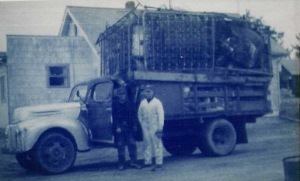 Once the garbage was collected, it was disposed of at a dump site that overlooked Baker’s Bay outside Ilwaco, where it was dumped over the hill onto the water’s edge. In 1958, at the request of the County Commissioners, the company purchased13 acres of property outside Long Beach. This was to become the new location of the dump. It was operated as a burning dump from 1958 thru 1972., until the Dept. Of Ecology ceased all burning at these facilities. It was then converted to a solid waste landfill. In the mid 60’s, the business was extended from the south end of Pacific County to encompass all of Pacific County and half of Wahkiakum County. Until this time, the customer base was on the peninsula only. The drivers were now driving over 200 miles a day on several routes to pick up customers who were miles apart from each other. The company also purchased its first drop box truck and two drop boxes. In 1982, the landfill was closed due to the additional costs required to meet the newer regulations governing landfills. At this time, a transfer station and recycling center was constructed on the site of the old landfill. The company’s recycling operation, which began by hauling away scrap metal, now keeps more than 2684 tons of recycled newspaper, magazines, cardboard, glass, plastic, and metal out of the landfill each year. They also ground up wood waste for ground cover and compost. In 1989, the company was one of the first in the state of Washington to start automating it’s routes, at which time all customers were provided with roller totes. Since that time, all the routes have been automated. Automation has made it possible for the drivers to have increased longevity with the company. Since 1991, all Pacific County garbage has been hauled by truck to a regional landfill in eastern Oregon. Over the last 56 years of business, the company has seen many changes. It has grown from one truck and one employee to twelve trucks and fifteen employees. The company has just completed a $2 million dollar remodel of the transfer station and recycling center. After the passing of both Art in 2000 and Donna in 2009, the company was owned by second generation family, brother and sister, Jay Alexander and Diane Carter. In January 2017 Jay Alexander bought out Diane Carter and he now runs the company with his wife Teresa Alexander. A third generation is also involved in the companies. In 2004 and again in 2010, the company was honored by the Washington Refuse and Recycling Association as “Company of the Year”. Jay is currently a board member of the WRRA.